I’m a chocolate lover. I’m also a fig lover. Then I took a trip to the Algarve and discovered that chocolate and fig had a love child, and its name is Alfarroba. Vacationing in the Algarve, the southernmost region of Portugal, has its benefits; and it’s not just for the beach and the great weather. The Algarve is home to an abundant variety of delicious local food, including: fresh seafood, oranges, figs, almonds and carob. For those of you unfamiliar with carob (alfarroba), it’s the dark and mysterious looking seed pod that comes from the alfarrobeira (carob tree). It also happens to be the source of several sumptuous and earthy desserts in Portugal! 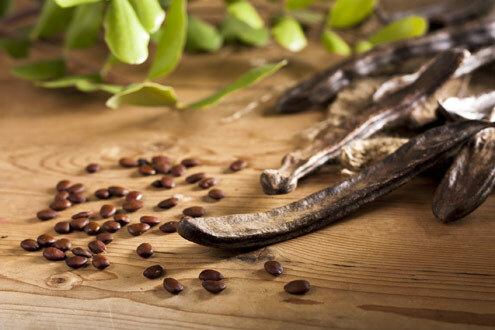 Portugal is one of the top producers of carob worldwide, thanks to the hot and dry southern Portuguese climate. Requiring very little water to survive, the region is ideal to nurture these hearty trees. The alfarroba pod is a slow grower, taking about six – eight years to produce fruit, though planted cuttings from another mature tree may only take 3 – 4 years in ideal conditions. Alfarroba seed pods also take an entire year each time to mature, dropping to the ground once ripe, and oftentimes, eaten by animals if they’re not collected quickly. The alfarroba pod has been reverenced for its diverse uses for thousands of years by several ancient civilizations. Naturally sweet, it was not only savored by the Egyptians, but also buried in their tombs. The Mesopotamians, on the other hand, used the alfarroba pods for sweets and juice, while the Romans had an appreciation for chewing on the dried pods. It’s believed that the alfarrobeira was brought by the Greeks from Asia Minor, then carried by the Moors to North Africa and the Iberian Peninsula. Both the Portuguese name alfarroba, and the English carob, originally derived from the Arabic word al kharr?b, meaning “locust bean pod”. It’s also believed that a carat, a weight of measurement for gold and gemstones, was equal to the weight of one alfarroba/carob seed; whereby the name carat stemmed from the scientific name for carob tree, Ceratonia siliqua, which derived from the Greek kerátion. Though inaccurate, it was once believed that every seed weighed exactly the same, which is why the Roman pure gold coin solidus, weighed exactly 24 seeds or carats. A chocolate lover will never give up chocolate, but they may come to love Alfarroba for its delicious similarities. It’s naturally dark brown in color like chocolate, it has a luxuriously rich flavor and it has a wonderful versatility in being able to be prepared in every kind of manner as chocolate. There are two main types of product processed from alfarroba: extract and flour. The extract of the seed’s gooey inside, which is known as the goma de alfarroba, or locust bean gum, is used as a stabilizer in many store-bought ice creams. The other byproduct is farinha de alfarroba (alfarroba flour or powder) is derived from grinding the seed pods after being toasted. In this form, the alfarroba flour can be used like cocoa powder, or even bread flour (along with regular flour), to make cakes, cookies, tarts, brownies and bread. 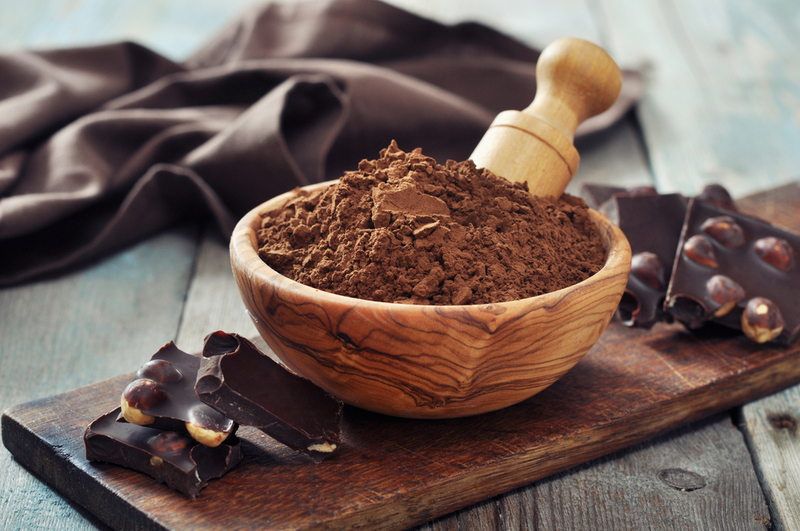 When you compare the nutritional makeup of Alfarroba powder to cocoa powder, Alfarroba is not only lower in fat, but higher in natural sugars. Therefore, a little bit of Alfarroba goes a long way in sweetening desserts! It’s also a good source of calcium, protein, magnesium, phosphorus, vitamins A and B and naturally high in fiber. This, along with its rich antioxidant effect from the polyphenols from tannins make alfarroba a fabulous digestive aid. Additionally, Alfarroba doesn’t contain any of the stimulant allergens found in chocolate – caffeine and theobromine – the chemical found in chocolate to be poisonous for dogs; hence, many “chocolate-flavored” dog treats are made with alfarroba powder. 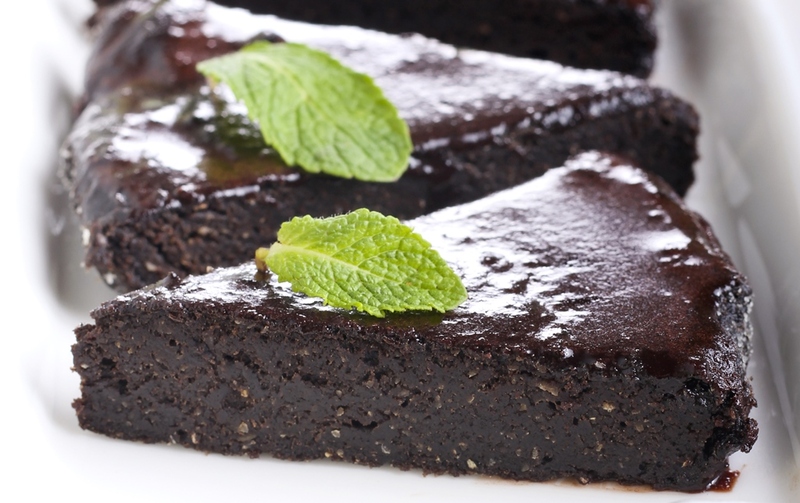 Alfarroba makes a great chocolate substitute prepared on its own, so many traditional Algarvian dessert recipes give alfarroba the spotlight. The most ubiquitous is the bolo de alfarroba, your straightforward chocolate cake, followed by the torta de alfarroba, a cake roll, typically filled with an egg-yolk custard. And let’s not forget the bolachas and biscoitos de alfarroba (alfarroba cookies and biscuits), which can range from healthy, high fiber biscuits sold in health food stores or the sweeter dessert style cookies. If you’re keen for an incredible pairing, add fig or almond. Since all three of these thrive naturally in the region, it’s no wonder they taste fabulous when mixed together. The majority of traditional Algarvian alfarroba recipes contain either one or both of these best friends, which might appear as a tarte de alfarroba, figo e amendoa– alfarroba, fig and almond tart. Other traditional pairings might include: orange, honey and coffee (espresso). And of course, we can’t forget that every native fruit in Portugal must be made into a liqueur, and Algarve’s licor de alfarroba can easily stand on its own. In recent years, both the Algarve region and Lisbon have seen an increase in awareness of the benefits of alfarroba. Newly established health stores, and the expansion of the health-food section in supermarkets, now sell a lot more of the healthy alfarroba cookies and biscuits, as well as the alfarroba flour/powder to make your own recipes, as it has shown it can even be used to control glycemic levels in diabetics. Even some brands of whole wheat bread use a touch of alfarroba flour. Portuguese chefs have also been playing around with alfarroba in savory recipes, such as the trendy pão de alfarroba (alfarroba bread) and bolo de caco de alfarroba– the variation of bolo de caco, a type of English Muffin looking flatbread from the Madeira islands. Both of these are strange looking black bread but are very rich in flavor with a touch of sweetness, almost as if the bread were made with dark molasses. If a trip to the Algarve isn’t on your 2015 vacation list, why not make a cake for yourself! Check out our recipe for Bolo de Alfarroba!